Hillary Homzie has written several books for tweens, including Things Are Going to Get Ugly, The Hot List, and Queen of Likes for Aladdin Books of Simon & Schuster. She lives in Napa, California, with her family. Ellie May wants desperately to be flag leader in class this week, but can she figure out how to please her teacher? Ellie May hasn't been flag leader in months even though she waves her hands enthusiastically every morning to be picked. 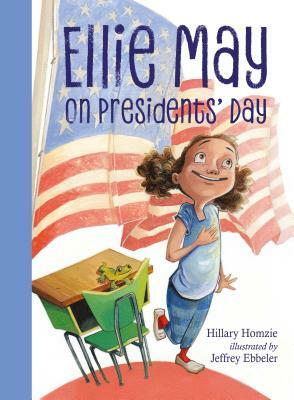 Her class is learning about U.S. presidents for Presidents' Day, and Ellie May figures that if she can act like a president, maybe Ms. Silva will pick her. Chopping down a class plant so that she can tell the truth about it, as George Washington supposedly did, doesn't work. (Ava, know-it-all-turned-friend, and Ms. Silva both explain that the cherry-tree story is a myth.) Taking apart the class pencil sharpener because Abraham Lincoln liked taking gadgets apart completely backfires. When she owns up to her actions though, she is surprised by the results. The classroom is ethnically diverse—Ellie May, Ava, and Mo appear black (notably, Ava has a dark skin tone); the teacher presents as white. While the text clarifies that presidents were just people, the uncritical glorification of historical presidents by black kids (who would have been treated poorly by them) seems a little off-key. For more of her antics, see Ellie May on April Fool's Day. An appended note on the Pledge of Allegiance omits mention of "under God"; it's followed by a note on Presidents' Day. Like a Clementine of color, Ellie May is a protagonist readers can feel for even if they don't share her preoccupations. Second-grader Ellie May is a live wire with a good heart and less good impulse control. In Ellie May on Presidents’ Day, she’s desperate for her chance to be class flag leader, but when she tries to impress her teacher with her devotion to George Washington–style honesty, she ends up insulting her classmates instead. In Ellie May on April Fools’ Day, our heroine is jealous of Mo, the class funny guy, and wants to pull off a great prank herself; unfortunately, she takes things too far. Ellie May is a sympathetic heroine in her yearning for recognition (“Mo’s funny. Ava is smart. You’re artsy. I just want to be something too”), and the episodic chapters make for approachable and humorous early reading. Spirited, cartoonish black and white art has an appropriately chaotic edge in its interpretation of Ellie May’s diverse classroom and mixed-race family. Since the relevant holiday gets decent coverage in each book, this offers the possibility for solid curricular use as well as an amiable new series friend.